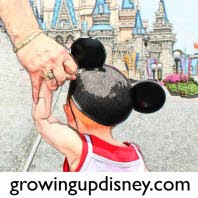 Growing Up Disney: #300 - Time to Celebrate!!! Some milestones go quietly unnoticed. While posting the Photo Flashback for today (2/23/2011) I noticed that yesterday post - Random Mouse Sightings - is the 300th post for GrowingUpDisney.com. That in itself is quite an accomplishment. I have noticed a lot of well intentioned bloggers start a blog and soon fall by the wayside. While GUD has gone from 5 to 3 days a week for posts the energy is still there. Amy has managed quite a lot taking care of a husband, Tink, getting ready for a new baby, and moving half-way across the country -- plus she has 2 other blogs where she keeps family & friends updated on Tink and another where she is chronicling their cross-country move. Chris has been blogging about his Solo Trip and will be doing some "live" blogging while at WDW. He has been getting ready for this trip, bought more camera equipment and a new camera bag so he can take lots of new photos to share with GUD readers. He always gives a unique perspective on WDW. Amy also has a group of Minnie Moms and other friends who do some outstanding guests posts. As father to these two wonderful journalists I am allowed to contribute a few posts. Today, I want to congratulate Amy & Ridge on the work they have done making this milestone. There is lots more to come as we take part in this project started by Amy to share Growing Up Disney. Thanks to all who take time in your day or week to share our stories, pictures and daily musings. from DisneyDad --- you continue to amaze me. Congratulations! I have really loved reading all the posts here on Growing Up Disney! Thank you so much for sharing all your family's Disney moments and tips and with us, the readers! Thank you, Dad, for the kind words. And thank you for all the memories. Looking forward to making many more. Thank you, Beth and all of our other readers, for sharing this adventure with us. looking forward for many articles to come! Thanks Pop, Who would have thought almost a year ago we would have come so far. Thanks to Amy for igniting this little candle.